Advanced System Care Pro 11.5.0 was available as a giveaway on October 9, 2018! 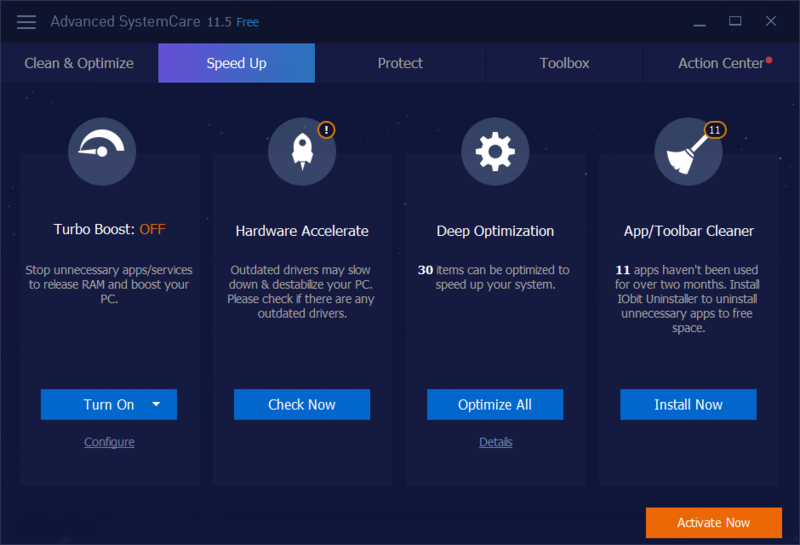 How would you improve Advanced System Care Pro 11.5.0? If you can't activate the code, it is most likely that we have exceeded the activation limits set by the developer. We've already contacted iObit representatives and asked them to extend the number of available activations. Please mind that due to the differences in time-zones it may take a while before we resolve the issue. Giveaway of the Day, how i can use the code ? 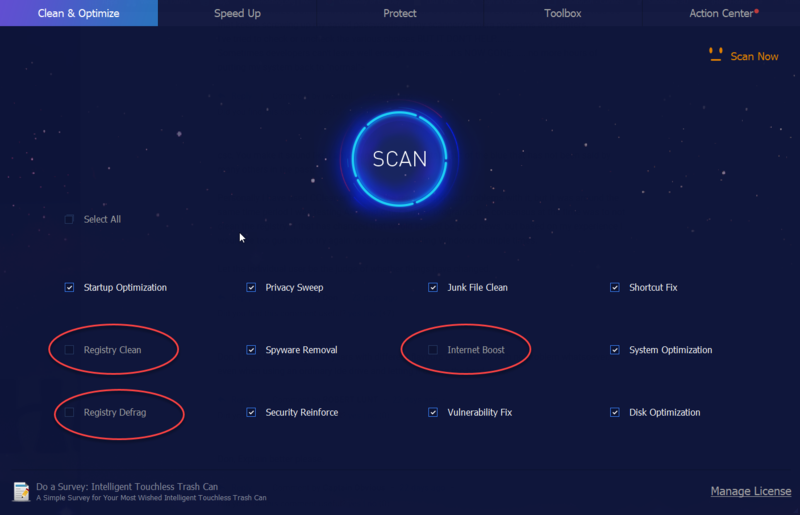 Everyone should be using Acronis Cloning Software which just copies everything exactly as your computer is currently as you do it before updating or cleaning anything on your computer. So an example, You have a Window Updated, Graphics Card Update, or anything else notifies you of needing any updates as you do it and later experienced that update messed up your PC and ruined your day. Or If you've used Advanced SystemCare (ASC) or CCleaner or any other software is similar. Acronis cloning software will let you go back before you did any updates or cleaning on your computer. Don, Just uncheck Registry Clean, Registry Defrag, and Internet Boost (for those who have custom settings for your internet) and I never had a problem. <a href="https://imgur.com/v1C5pkq"><img src="https://i.imgur.com/v1C5pkq.png" title="source: imgur.com" /></a> or [img]https://i.imgur.com/v1C5pkq.png[/img] or URL of ScreenShot of what I'm talking about: https://i.imgur.com/v1C5pkq.png Everyone should be using Acronis Cloning Software which just copies everything exactly as your computer is currently as you do it before updating or cleaning anything on your computer. So an example, You have a Window Updated, Graphics Card Update, or anything else notifies you of needing any updates as you do it and later experienced that update messed up your PC and ruined your day. Or If you've used Advanced SystemCare (ASC) or CCleaner or any other software is similar. Acronis cloning software will let you go back before you did any updates or cleaning on your computer. I have downloaded previous versions of this program here before and I have also bought the program from the company for my computers. It has been for me one of my favorite programs to keep my system running the way I want it. I rely on the included Performance Monitor to keep my ram usage in check when I am using too many tabs in my browser. How do you get the code? does it just show up or do you email it to us? Just purchased a 3 licence one for £10.58 from a company " Dealarious" only yesterday. the cheapest one I have found. been using it for years, great program, if you have an ssd drive untick the "registry defragment box " highly recommended. and free for 6months. worth a try ideal for anyone new to computing, just leave everything on default setting until you are more savvy. "just purchased" and "been using it for years"? ROBERT LUNT, "just purchased" and "been using it for years"? Just means he has been using a single license for years and has just now purchased a 3 PC License Pack. How is this the Pro version? It shows me the free version. See [ Enter code ] in the lower right opening screen ...?
. [ JP Onwater ], See [ Enter code ] in the lower right opening screen ...? . i have read many reviews, the biggest criticism of this software is that it does harm to the registry. multiple comments of bad registries over time. My recommendation is to use the functions selectively and dispense with the auto features. Programmers comment on this would be appreciated. I either un-check the registry before scanning, or go to options, and uncheck any and all registry checks there. ... collectively offer controls under one panel that hare hard to accomplish otherwise. Note, all of those continue to work forever in the free version, too.
. [ George Ducas ], I either un-check the registry before scanning, or go to options, and uncheck any and all registry checks there. Other stuff, especially the tools, are terrific, like [ System Control ], [ Program Deactivator ], [ Default Program ], [ IE Helper ], and [ Startup Manager ] ... collectively offer controls under one panel that hare hard to accomplish otherwise. Note, all of those continue to work forever in the free version, too. . . I've been using Iobit's ASC for over a decade and even utilized it when working on customers' PCs as a DSL tech for AT&T. Nothing but praises. Folks, if you must use this type of program, whatever you do, do NOT let it touch the registry!!! If you, sooner or later you will have to reinstall Windows. Folks, if you must use this type of program, whatever you do, do NOT let it touch the registry!!! If you, sooner or later you will have to reinstall Windows. You have been warned. Don, I've been repairing and upgrading PC's for over 20 years, and your statement is a fallacy. IF you know what you're doing, there are literally hundreds of worthless reg entries that can be deleted. BUT, that is an IF! UN-knowledgeable people should leave it alone and live with just how slow the worthless junk makes your pc. Don, I've been cleaning my registry with Piriform's CCleaner for years with zero problems. I have no idea if the giveaway today is any good, don't need it, but you can't criticize all software of a certain type because one was a lemon. csc, Same here. Many years, many computers. 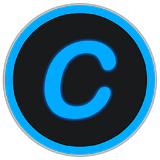 Well I can criticize CC...........in recent times with their STUPID UPDATES I finally figured out it was CC that keeps screwing up my saved passwords, all my scanner/camera programs and printers. csc, You make it sound like I am saying something totally out of the blue that has not been said by many others in the past. Personally I have used CCleaner to clean the registry and had problems with it, but it was around the same time period I was testing ASC and other similar programs, the consensus at the time was to not clean the registry, if that has changed that would indeed be good news, but based on my experience I would be too gun shy to try again, weary of reinstalling Windows multiple times. Let the individual user be the judge of whether things have changed. csc, You make it sound like I am saying something totally out of the blue that has not been said by many others in the past. Personally I have used CCleaner to clean the registry and had problems with it, but it was around the same time period I was testing ASC and other similar programs, the consensus at the time was to not clean the registry, if that has changed that would indeed be good news, but based on my experience I would be too gun shy to try again, weary of reinstalling Windows multiple times. Let the individual user be the judge of whether things have changed. Don, I have been using it for years with different flavours of windows with no problem whatsoever. even when using an ordinary ide drive and letting it defrag the hard drive. Don, perhaps it's something else you're doing wrong that, in combination with a registry cleaner, is causing problems for you and others. I have used ASC Pro for many years including the registry cleaner and never had any problems at all. csc, I’ve also been using CCLeaner for years with zero problems. In fact, a couple of years ago a friend who was in charge of computer security at the FBI before he retired (and is now in responsible for computer security at a large stock brokerage firm), said the first software I install on my (then-new) computer should be CCleaner and MalwareBytes. On the other hand, before that, I used SystemMechanic to “optimize” a previous computer. It deleted essential files from the registry, and I ended up reinstalling Windows and all software. I don’t see how you can judge a software application on the basis of another application. csc, I’ve also been using CCLeaner for years with zero problems. In fact, a couple of years ago a friend who was in charge of computer security at the FBI before he retired (and is now in responsible for computer security at a large stock brokerage firm), said the first software I install on my (then-new) computer should be CCleaner and MalwareBytes. On the other hand, before that, I used SystemMechanic to “optimize” a previous computer. It deleted essential files from the registry, and I ended up reinstalling Windows and all software. I don’t see how you can judge a software application on the basis of another application. Don, reinstall in 2018? :D You don't heard about backup programs that restore a working system in a few minutes?
. [ Don ], I either un-check the registry before scanning, or go to options, and uncheck any and all registry checks there. Other stuff, especially the tools, are terrific, like [ System Control ], [ Program Deactivator ], [ Default Program ], [ IE Helper ], and [ Startup Manager ] ... collectively offer controls under one panel that hare hard to accomplish otherwise. Note, all of those continue to work forever in the free version, too. .
Any Help I Can Get On This? Activation Code That I Got Says It's Invalid. Yes I Did Copy And Pasted... Any Help I Can Get On This? You do not allow USB installation. Precisely why I am not going to install your program. ... so I guess you have to install it once, then you can make the Zip portable version, use that, and uninstall the full version, I suppose.
. [ Manny ], Yes, you can make a working Zip copy for use on a USB drives, see the [ Toolbox ] features [ ASC Portable Version ] from inside the program, ... so I guess you have to install it once, then you can make the Zip portable version, use that, and uninstall the full version, I suppose. . I don't use a proxy server. Never had this problem before with any download. Same issue a others. Wants proxy server info. I don't use a proxy server. Never had this problem before with any download. Chuck, did you try to run it from inside the zip. It dose not work. I had the same thing and then droped it on the DT and it works just fine. Have used ASC on and off for years. MJC, Thanks. Still doesn't work. Have used ASC on and off for years. Never had a problem before. setup.exe will not run in my Win 10 64....absolutely nothing happens!! Myk Kelly, Make sure you turn off either your shields or antivirus altogether. Refuses to install. Complains about proxy. While I feel that this is probably an okay program, I don't want to get into using it only to have to pay for it Six months later, especially when I know that I will not have the funds when it comes time for renewal. Thank you anyways. The free version has most features minus a few tools and auto update, and the pro version reverts to the free version forever at the end of the subscription -- I've hardly ever used the pro features even when I occasionally had the pro version.
. [ Steven Frizzell ], The free version has most features minus a few tools and auto update, and the pro version reverts to the free version forever at the end of the subscription -- I've hardly ever used the pro features even when I occasionally had the pro version. . Thank you very much. My copy was due to expire later this month. Now I can use again for 6 months. Very grateful. ... we're all learning to remove nag resident programs from everyone, not just IObit -- read the entire thread for tools to help.
. [ Allan ], Yeah, like Microsoft products do ... and Apple products ... and Intel, and Norton, and Adobe and ... ... we're all learning to remove nag resident programs from everyone, not just IObit -- read the entire thread for tools to help. . 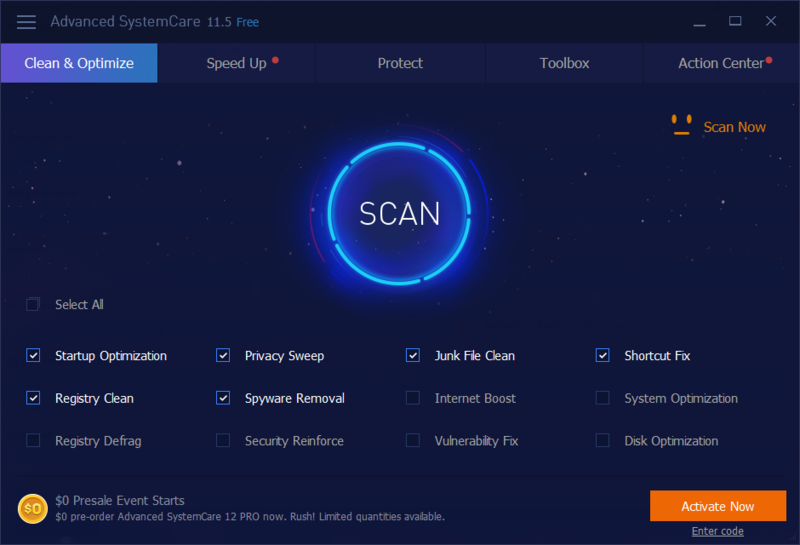 Though cleaned regularly using CCleaner and WISE Care, http://phota.me/Wcuj.png shows Advanced System Care Pro 11.5.0 found 578 invalid registry entries!! Absent from the above and other programs, it performed 36 internet improvements and 12 system optimizations! Copied onto a thumb drive and run, about the same optimizations were performed on another laptop. Whether improvements will be felt, like other programs, it's hard to tell. Though cleaned regularly using CCleaner and WISE Care, http://phota.me/Wcuj.png shows Advanced System Care Pro 11.5.0 found 578 invalid registry entries!! Absent from the above and other programs, it performed 36 internet improvements and 12 system optimizations! Copied onto a thumb drive and run, about the same optimizations were performed on another laptop. Whether improvements will be felt, like other programs, it's hard to tell. Hon Kong, Actually, messing way too much with the registry is one of the reasons I stopped using Advanced System Care. If you insist in letting it do so, sooner or later you will be sorry. Speaking from experience. Yes, it improves performance, but having to reinstall Windows to fix registry issues is not my idea of an improvement. Hon Kong, Actually, messing way too much with the registry is one of the reasons I stopped using Advanced System Care. If you insist in letting it do so, sooner or later you will be sorry. Speaking from experience. Yes, it improves performance, but having to reinstall Windows to fix registry issues is not my idea of an improvement. Don, Should have backed up your registry first ... Lessons to be learned. I can just appreciate your gesture for us who are not so pocket fit. After a little use I cud tell more (not by download :) ) I can just appreciate your gesture for us who are not so pocket fit. Thank you ! I've been using Avanced System Care for a number of years and are happy with this product. It's easy to use and gets the job done. I've been using Avanced System Care for a number of years and are happy with this product. It's easy to use and gets the job done. Neat site at [ PissedConsumer . com ], some tips and tricks there, BUT without a DATE on the complaints, there's not much I can correlate to today's offering BUT one complaint said they called IObit and the IObit tech demanded remote access then claimed there were 300+ viruses and claimed it needed additional service right now ... c'mon, folks, never execute a transaction you did not initiate ... the "customer" hung up, but said no more in their complaint. When I call ANY tech support, I just say "uh huh, uh huh, okay, I'll try that can call back" and then search the web and or call in again up to 3 times to see what other techs at that company says averse to each other. But I am curious, if IObit DOES scam / phish when folks call for support, PLEASE tell us to warn us.
. [ Frankmeister ], Neat site at [ PissedConsumer . com ], some tips and tricks there, BUT without a DATE on the complaints, there's not much I can correlate to today's offering BUT one complaint said they called IObit and the IObit tech demanded remote access then claimed there were 300+ viruses and claimed it needed additional service right now ... c'mon, folks, never execute a transaction you did not initiate ... the "customer" hung up, but said no more in their complaint. When I call ANY tech support, I just say "uh huh, uh huh, okay, I'll try that can call back" and then search the web and or call in again up to 3 times to see what other techs at that company says averse to each other. But I am curious, if IObit DOES scam / phish when folks call for support, PLEASE tell us to warn us. Thanks. .
WHERE do I put the activation code? I downloaded it and went through the whole menu on the ASC and there is no place to put the code in. I'll just uninstall this and go back to the prior version. If it says [ Pro ] at the top, then your license from the previous version is already installed, carrying over to this version. Try any [ Pro ] feature in the program, and if it works, you win, otherwise it will THEN ask. Otherwise, click [ Enter code ] UNDERNEATH the big orange [ Activate Now ]. [ Activate Now ] means "go to web to BUY it", so, don't click [ Activate Now ].
. [ Me ], If it says [ Pro ] at the top, then your license from the previous version is already installed, carrying over to this version. Try any [ Pro ] feature in the program, and if it works, you win, otherwise it will THEN ask. Otherwise, click [ Enter code ] UNDERNEATH the big orange [ Activate Now ]. [ Activate Now ] means "go to web to BUY it", so, don't click [ Activate Now ]. .
LOVE this, thanks -- mostly I use the [ Toolbox ], not the auto-clean anything, because I prefer to manually select what I want, and what I delete. -- IObit ( and other programs, IObit is by no means unusual ) installs auto-start background programs, but none from IObit are malicious, they nag to buy this and other IObit programs, so to eliminate the nag, and other unintended auto-stuff, always turn off auto stuff using free programs like Microsoft Sysinternals AutoRuns and ProcExp, MSConfig, Task Manager, and so on, and then reboot after running any IObit program ( though IObit Smart Defrag recently did NOT install any background nags -- good for them ! ).
. LOVE this, thanks -- mostly I use the [ Toolbox ], not the auto-clean anything, because I prefer to manually select what I want, and what I delete. Note, folks: -- the free version is plenty, the pro version adds some auto-update and tools features, but reverts to free after the pro license expires, so the free features work forever, -- IObit ( and other programs, IObit is by no means unusual ) installs auto-start background programs, but none from IObit are malicious, they nag to buy this and other IObit programs, so to eliminate the nag, and other unintended auto-stuff, always turn off auto stuff using free programs like Microsoft Sysinternals AutoRuns and ProcExp, MSConfig, Task Manager, and so on, and then reboot after running any IObit program ( though IObit Smart Defrag recently did NOT install any background nags -- good for them ! ). .
... I will never understand who votes and why, the above information got + and minus votes over time, now resting at -6. -- and the background auto-install stuff is obnoxious, but not risky, and easily removed? I think that if folks can't even understand the "Did you find this comment useful?" question, then no wonder folks have such difficulty figuring out the software download, the install, the registration, and the use of GOTD's offerings.
. ... I will never understand who votes and why, the above information got + and minus votes over time, now resting at -6. So, some think that it was not helpful for them to review end user witness testimony that -- the tools are useful -- and the background auto-install stuff is obnoxious, but not risky, and easily removed? Okay. Vote on. I think that if folks can't even understand the "Did you find this comment useful?" question, then no wonder folks have such difficulty figuring out the software download, the install, the registration, and the use of GOTD's offerings. . I'm currently using Wise Care 4.6.7. How does this compare? Many overlapping tools, use whichever you can manage best, why not try it an you tell us?
. [ KK ], Many overlapping tools, use whichever you can manage best, why not try it an you tell us? . -- don't run ANYTHING in auto-clean mode. -- but I do use a variety of utilities because each has features and benefits that are unique.
. [ Stephen Grant ], If you mean "don't leave 2 utilities in auto-clean mode", great advice, and may I add: -- don't run ANYTHING in auto-clean mode. -- but I do use a variety of utilities because each has features and benefits that are unique. I especially like -- Kerish Doctor advice and tools, -- Boost by Reason, -- Process Lasso, -- WinUtilities Memory Optimizer, -- Glary Startup Manager, -- SysInternals AutoRuns and ProcExp, -- Malwarebytes ADWCleaner, ... and more. ..
KK, I use both without any issues. Just make sure that they shut down when done instead of remaining in memory. Both try to display status indicators and it is just a waste of resources. Yes, that's EXACTLY what happens when you abandon responsibility for your own computer. And not just with IObit ... have you ever clicked on ALL Microsoft updates, or left them on auto-install, including to Windows 10, and then wonder what happened averse to your intentions? Instead, responsible users know their choices well before they click "yes, continue". IObit doesn't surprise me because I inspect what I expect before clicking through -- it's MY computer, after all.
. [ Jeff ], Yes, that's EXACTLY what happens when you abandon responsibility for your own computer. And not just with IObit ... have you ever clicked on ALL Microsoft updates, or left them on auto-install, including to Windows 10, and then wonder what happened averse to your intentions? Instead, responsible users know their choices well before they click "yes, continue". IObit doesn't surprise me because I inspect what I expect before clicking through -- it's MY computer, after all. .
... wait ... what ... are you saying you WANT one-click-does-all or are you saying you DON'T WANT one-click-does-all ? ! ?
. [ Retro ], ... wait ... what ... are you saying you WANT one-click-does-all or are you saying you DON'T WANT one-click-does-all ? ! ? . Thanks for explaining, but no, one-click never before did everything, especially uninstall programs you no longer need or didn't know were installed, or update hardware drivers and resolve driver conflicts, hence IObit's tease to also download and install IObit Uninstaller and IObit Driver Booster.
. [ Retro ], Thanks for explaining, but no, one-click never before did everything, especially uninstall programs you no longer need or didn't know were installed, or update hardware drivers and resolve driver conflicts, hence IObit's tease to also download and install IObit Uninstaller and IObit Driver Booster. . However they are good at fixing any errors in their products and always get back to you on any error you might find. Generally most of their products have very few errors. However they are good at fixing any errors in their products and always get back to you on any error you might find. Generally most of their products have very few errors. Retro, I'm happy with my 6 month licence, looked but the 1 year free I could find turned out to be three months trial, then a year using my bank details. Kenneth Smith, Windows 8, 8.1 and 10 has a maintenance center, more than enough to keep your PC clean. Other cleaners are unnecessary. Ivanovich, please don't make comments about subjects of which you are wholly ignorant. The pro version adds tools and auto-update as well as deeper registry cleaning ( meaning, deeper register damage ).
. [ Kenneth Smith ], The pro version adds tools and auto-update as well as deeper registry cleaning ( meaning, deeper register damage ). .
( 1 ) Run ANY 3rd-party cleaner after running ANY Microsoft cleaner to confirm that, no, Microsoft does not clean everything or even many things that are a unnecessary to have on one's hard drive ( and to always space-wastefully and time-consumingly have included in backups, check-disk scans, malware scans, defrag scans -f-o-r-e-v-e-r- ). 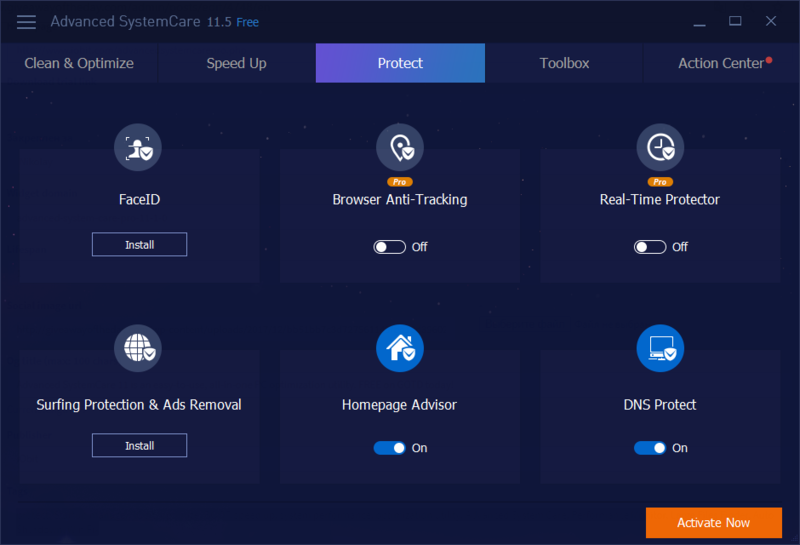 ( 2 ) IObit Advanced System Care includes many tools for adjusting and tweaking settings for Microsoft and other products, and features, such as auto updating, NONE of which are included in Microsoft's "maintenance center". ( 3 ) Microsoft themselves purchased and offers FREE the powerful suite of SysInternals utilities to go far beyond Microsoft's own meager pedestrian minimum "maintenance center" placebo. Enjoy, folks, and don't be afraid -- be aware, be curious, be informed, be intelligent, and be powerful.
. [ Ivanovich ], ( 1 ) Run ANY 3rd-party cleaner after running ANY Microsoft cleaner to confirm that, no, Microsoft does not clean everything or even many things that are a unnecessary to have on one's hard drive ( and to always space-wastefully and time-consumingly have included in backups, check-disk scans, malware scans, defrag scans -f-o-r-e-v-e-r- ). 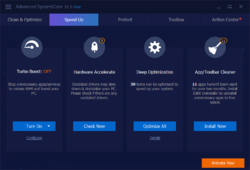 ( 2 ) IObit Advanced System Care includes many tools for adjusting and tweaking settings for Microsoft and other products, and features, such as auto updating, NONE of which are included in Microsoft's "maintenance center". ( 3 ) Microsoft themselves purchased and offers FREE the powerful suite of SysInternals utilities to go far beyond Microsoft's own meager pedestrian minimum "maintenance center" placebo. Enjoy, folks, and don't be afraid -- be aware, be curious, be informed, be intelligent, and be powerful. .
Microsoft doesn't even claim to do what IObit and other utilities offer that end-users and administrators want, and Microsoft effectively admitted their own incapabilities by having to go out and purchase SysInternals because no one at Microsoft knew how to accomplish what SysInternals can do. Microsoft ain't thinking of your computer, they are thinking of your wallet, they are a marketing company, not an original source of programming savvy company -- almost everything Microsoft markets they purchased from other original programmers, they did not invent themselves.
. [ Ivanovich ], Microsoft doesn't even claim to do what IObit and other utilities offer that end-users and administrators want, and Microsoft effectively admitted their own incapabilities by having to go out and purchase SysInternals because no one at Microsoft knew how to accomplish what SysInternals can do. Microsoft ain't thinking of your computer, they are thinking of your wallet, they are a marketing company, not an original source of programming savvy company -- almost everything Microsoft markets they purchased from other original programmers, they did not invent themselves. .
Ivanovich, I know Windows 10 does and 8 did also. Its just I've had ASC in my system for so long I just wait for this to come along and get the free license every time. Im grad with associates in IT, but sometimes even we don't like to change things. Zen , I agree with you on that one. You can run CCCleaner, ASC Glary Utilities and many others back to back and yes each one is going to find something the previous scan missed on their looking for problems. Kenneth Smith, CCleaner, ASC Glary Utilities, WinUtilities, Wise Utilities and a few others, also the rentalware, claiming that they have the best maintenance program for you. Who still believes that kind of developers?